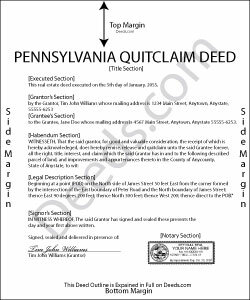 A quitclaim deed that is intended to release any land or interest in land in Pennsylvania should be signed and acknowledged by the parties executing it and recorded in the proper county. A Certificate of Residence that lists the grantee's name and address and is signed by the grantee must accompany the quitclaim deed presented for recording (PS 16-9781). The legal effect of recording a quitclaim deed in Pennsylvania is to give constructive notice to subsequent purchasers, mortgagees, and/or judgment creditors of the parties to the conveyance (PS 21-357). In order for a quitclaim deed to provide constructive notice, at least one of the following conditions must be satisfied upon recording: the Uniform Parcel Identifier is included and it is indexed properly in an index arranged by parcel identifier numbers, or the quitclaim deed is indexed properly as to the party in all alphabetical indexes (PS 21-358). A deed that is not acknowledged or recorded is fraudulent and void to any subsequent bona fide purchaser or mortgagee or holder of any judgment, without actual or constructive notice unless such deed, conveyance, contract, or instrument of writing is recorded before the recording of the deed or conveyance or the entry of the judgment under which such subsequent purchaser, mortgagee, or judgment creditor shall claim (PS 21-351).